We live in a rapidly changing society where almost everything is becoming tech, which means the education landscape has had to adapt fast to prepare students for a brave new world. The workplaces of tomorrow will not only require people to use and manipulate technology but will also require employees to cope with ever more advanced machines. But even with the rapid development of the likes of AI, humans can still outpace machines when it comes to design, innovation, and entrepreneurship, so students need to develop these skills through a design thinking process of empathising and defining the problem, ideating, and prototyping and testing. Understandably, all this means parents are searching for education facilities that are ahead of the game. In that vein, a recent awards ceremony recognised the UAE schools leading the way in future focused learning. One of the pioneers recognised is the American School of Dubai (ASD). Superintendent Dr Paul Richards explained that his institution is truly embracing the power of technology: “We do this in order to reimagine the learning environment, personalise learning pathways and cultivate collaboration, communication and innovation within and beyond the walls of ASD. At ASD key investment is also being made in the school’s spaces, creating more flexible learning environments by tearing down some walls or repurposing classrooms. It has spent heavily in maker spaces and says it will continue to invest further into robotic labs and STEAM – an educational approach to learning that uses science, technology, engineering, the arts and mathematics as access points for guiding student inquiry, dialogue and critical thinking. Another school that has been gaining accolades is Fairgreen International School in Dubai. Graeme Scott, the school’s director, believes a balanced approach to technology is the way forward. “We know that new technology presents incredible opportunities for our students, but we are also aware that it can throw up a whole host of issues if children are not taught ethical and responsible ways to use it. “We need to not only prepare our students for the interconnected world they are living in but also emphasise the importance of disconnection, or perhaps a reconnection with nature rather than a device. “For example, mindfulness allows us to separate from technology, live in the moment and to slow down a little; be more reflective. Students today need those transitions.” Investments in technology at Fairgreen centre on some of its signature programmes, such as urban farming, solar energy and sustainable construction. “Our students are already using tower gardens to cultivate their own vegetables using vertical farming techniques,” says Scott. Meanwhile, Riverston School Dubai has invested in an impressively well-equipped ICT laboratory that consists of ten computers, ten iPads and several programmable robots. Students there have two 35-minute lessons a week in the laboratory where they are taught computing and programming skills. They can also access the room at other times during the working week if needed to help support other lessons. 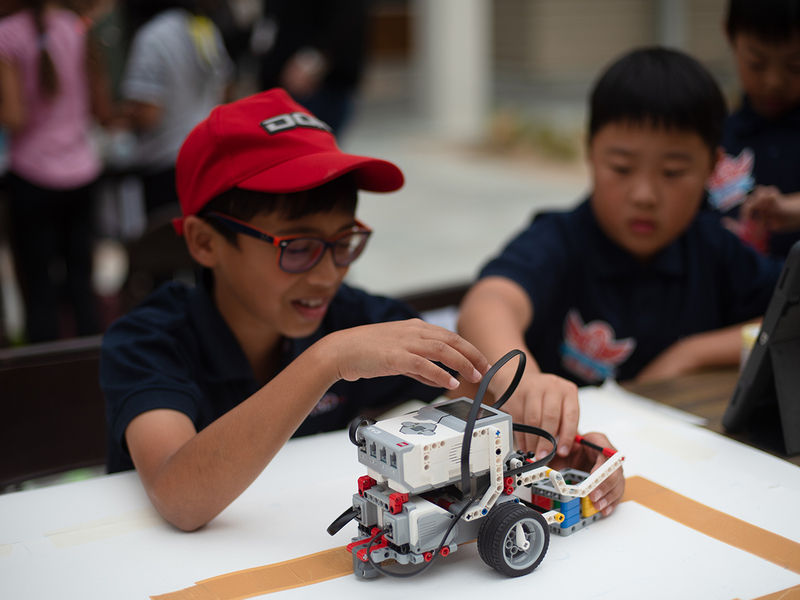 David Quick, Founding Principal, Riverston School Dubai, says that schools must innovative in their approach to learning and teaching to keep up.